BJP will contest against its allies Mizo National Front and National People's Party in the assembly polls. 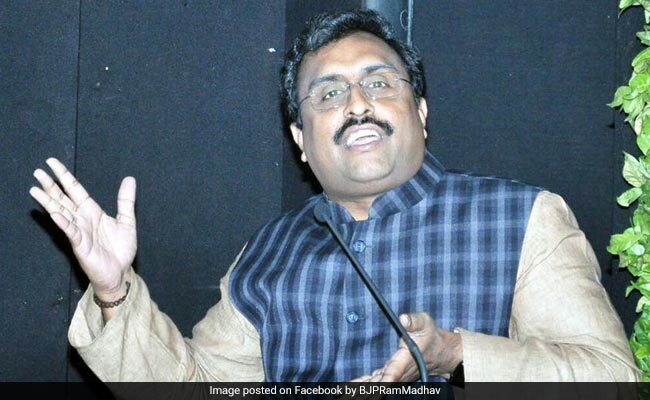 BJP general secretary in-charge for the North-East Ram Madhav said today that the party will fight the upcoming assembly elections in Mizoram on its own. However, he did not rule out an alliance with "like-minded" parties. The assembly elections in Mizoram are likely to be held later this year, along with Chhattisgarh, Madhya Pradesh and Rajasthan. Addressing a press conference in Aizawl, Mr Madhav said the BJP would field candidates in all 40 assembly seats if possible. He dismissed as "ridiculous" the Opposition's accusation that the Mizo National Front (MNF) is a "proxy" of the BJP. The BJP will contest against the MNF and the National People's Party in the polls, even though they are constituents of the North-East Democratic Alliance (NEDA). NEDA is a political coalition formed in 2016 by the BJP, along with regional political parties of the North-East. The BJP's decision to contest all the seats in Mizoram could be similar to the party's strategy in the Meghalaya assembly elections earlier this year. In Meghalaya, the BJP contested against other NEDA constituents like the NPP and United Democratic Party but the parties came together to form a coalition government after the elections. In what seemed as an attempt to counter the perception that the BJP supports a ban on beef in Mizoram, he asserted that the party "respected" the food habits, distinct cultural and customs of the Mizos and their religion. Mr Madhav accused the ruling Congress government, headed by Chief Minister Lal Thanhawla - which has been in power for the last 10 years - of being "corrupt and inefficient". According to the BJP leader, "The Congress regime failed to create any basic infrastructure during the last decade, even though the centre provided funding and initiated several projects". "If voted to power, the BJP would construct a four-lane highway across the state, linking both Myanmar and Bangladesh," Mr Madhav promised. The BJP leader also promised that engineering colleges would be established at Lunglei and Champhai districts if it comes to power.